Over the past few years, SiteGround have built up an impressive reputation — becoming a hosting company that’s well worth considering for anyone looking for affordable high-quality hosting services. Below, we’ll be going into everything they have to offer, and also looking at their three main WordPress hosting plans: StartUp, GrowBig and GoGeek, giving a particularly detailed comparison of the StartUp and GoGeek plans. 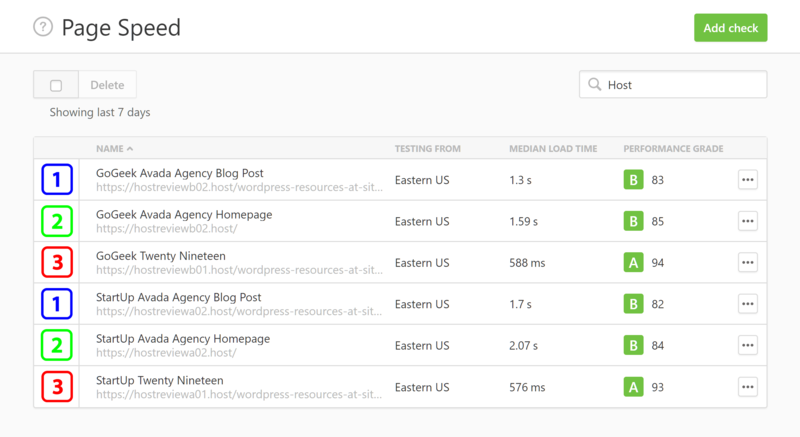 We performance-tested, measured, and monitored the speed of WordPress websites hosted on SiteGround’s StartUp and GoGeek plans (using the extremely popular Avada theme from ThemeForest), and also used independent ‘Load Impact’ testing services to see just how these sites handled multiple users accessing them at the same time. We then looked at the effect this had on the website/page loading times. Should you host with SiteGround? And, if so, which plan should you choose? How much do you need to pay? If you’re looking to host your WordPress website with a reliable host, as our previous hosting comparisons have shown, SiteGround are a great choice. But, with a few important differences between the plans — not to mention their different price points — you may be wondering whether you should choose the StartUp or GoGeek plan for your website. If so, you’ve come to the right place. While the StartUp plan is the entry-level managed WordPress hosting offering from SiteGround, GoGeek is the more powerful and expensive plan. There’s also a mid-range GrowBig plan that sits between the StartUp and GoGeek options. Although price shouldn’t be the only factor when choosing a hosting plan, your budget is likely to play a large role in your decision. So, with that in mind, here are the prices and key details of the StartUp and GoGeek plans. These are the key details of the managed WordPress hosting plans from SiteGround.  StartUp: $3.95* per month for one website, 10 GB of web space, and ~ 10,000 monthly visits. GrowBig: $5.95* per month for unlimited websites, 20 GB of web space, and ~ 25,000 monthly visits. GoGeek: $11.95* per month for unlimited websites, 30 GB of web space, and ~ 100,000 monthly visits. As you can see, if you want to host more than one website on your account, you’ll need to look beyond the entry-level StartUp plan. Also, as well as the allowances listed above, the GoGeek plan includes some additional useful features and tools, while also providing you with greater resources to improve the performance of your website. Websites hosted on the top-level plan also get access to extra levels of caching, further positioning the GoGeek plan as a potentially good choice for those seeking a fast-loading website on a budget. However, the test results you’ll see later on in this StartUp vs GoGeek comparison will show whether or not paying more actually does get you a faster website. With SiteGround, there aren’t any data transfer — also known as bandwidth — limits. Instead, the number of monthly visits your site receives is used as a reference point to help you to choose the right plan according to your traffic levels. However, although there are no limits on bandwidth and number of visits, there are other limits in place. These limits and allocations are covered in more detail later on in the WordPress Optimized Servers section of this review, but, to summarise, they cover the inode usage — something you can track yourself through your control panel. Now, let’s explore exactly what you get access to with the SiteGround StartUp and GoGeek plans — and what their main differences are. *Note: The prices listed are special introductory rates for new customers. 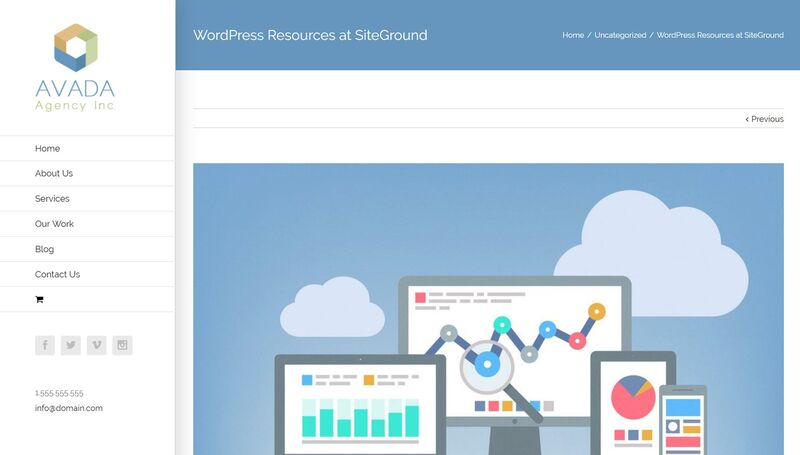 As the StartUp and GoGeek plans from SiteGround are advertised as managed WordPress hosting, this means that — among other things — you get access to web servers that are optimized for WordPress websites, as well as some extra features to help you set up and manage a safe and secure WordPress site. We’ll now explore the features of these plans — and their differences — to help you to decide whether StartUp or GoGeek is right for you. 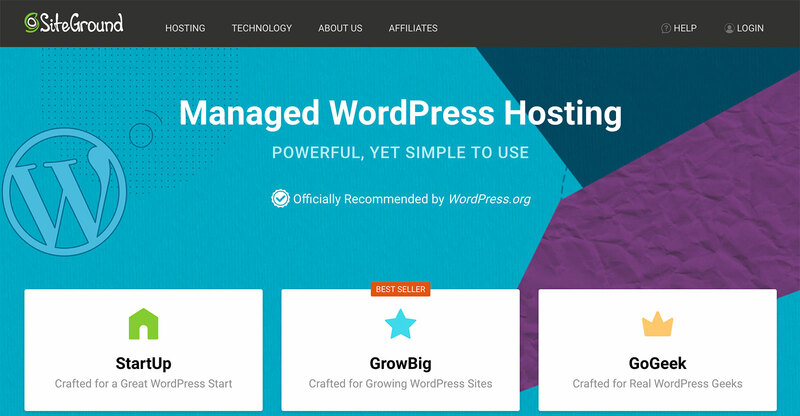 All of the managed WordPress hosting plans from SiteGround, such as the StartUp and GoGeek plans, include access to servers optimized for WordPress websites. Because of this, WordPress websites should load faster, while also being more stable and secure than those hosted on generic web servers. However, there are some differences in the type of server and database resources you’re allocated, depending on whether you choose the GoGeek or StartUp plan. The hosting plan you choose also dictates what server and database resources your website will have access to. Simultaneous server process: StartUp ten vs GoGeek 30. Inodes: StartUp 150,000 vs GoGeek 450,000. Database size: StartUp 500 MB vs GoGeek 1,000 MB. Database queries: StartUp up to 10% of server resources vs GoGeek up to 30% of server resources. Although not always the case when comparing numbers, for the above figures, higher is better. With more server resources available to your website, alongside the other performance-related features of the GoGeek plan, you can expect faster loading times from SiteGround’s top-level managed WordPress hosting plan compared with their lower-priced offerings. You can track how much of your resources, such as the inodes, you’re using through the cPanel interface of your account. Doing so is a good idea, because if you exceed your allowance your website will be taken offline until you’ve worked with SiteGround support to resolve whatever issue caused the consumption of resources. SiteGround will email you if you reach 90 percent of your total limit, but, because of the consequences of exceeding the limit, keeping an eye on your stats is recommended. You can view how much of your allocated server resources you’re using through the cPanel interface. Another good reason to choose SiteGround is if you already have a self-hosted WordPress website you’d like to move, as the process of migrating a WordPress site to SiteGround from another host is very straightforward. 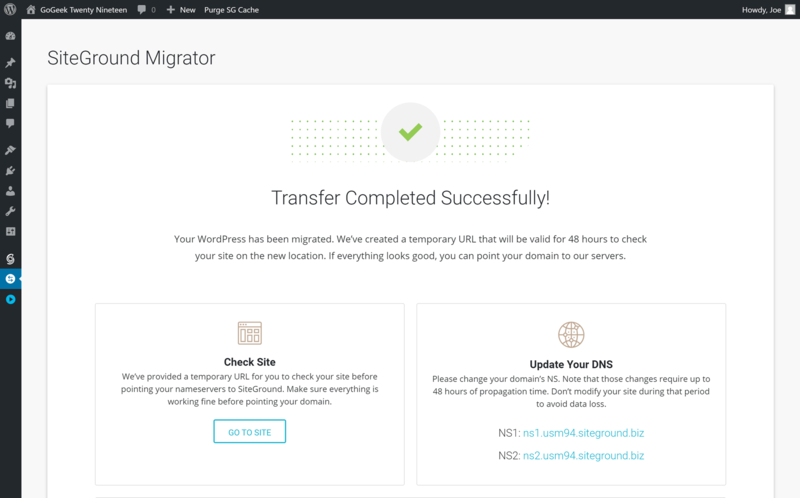 The GoGeek plan includes one free WordPress website migration per account, but on other plans you can use the SiteGround Migrator plugin to transfer your WordPress website. While those who choose the GoGeek plan get one hands-off WordPress website transfer that’s carried out by the SiteGround team as part of their package, those on the StartUp plan can use the free SiteGround Migrator plugin to perform the transfer themselves. Transferring a WordPress website with the SiteGround Migrator plugin is very straightforward. Migrating a WordPress website with the SiteGround plugin only involves a few straightforward steps, so everyone should be able to complete the process themselves. However, if you’d like the peace of mind that comes from knowing someone experienced has migrated your site for you and checked everything has been transferred correctly, the GoGeek plan may be more appealing. 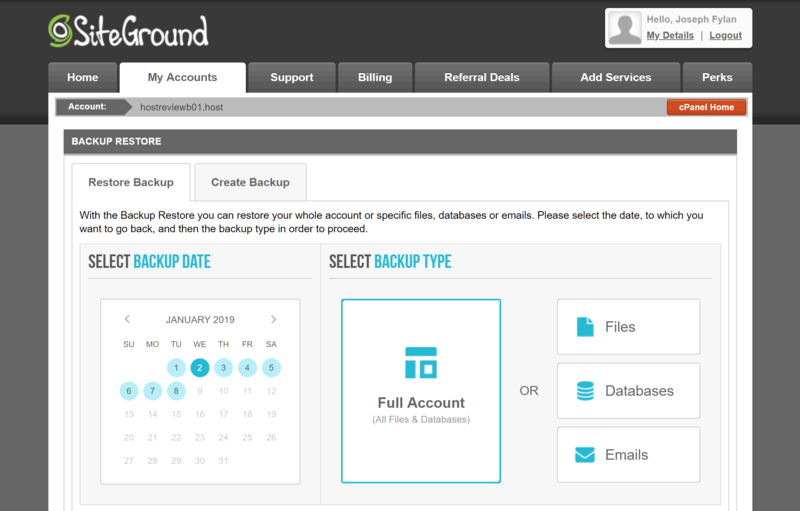 As mentioned earlier, the managed WordPress hosting plans from SiteGround include automatic daily website backups. Thanks to this, if something goes wrong with your site, you’ll have access to a full backup that’s no more than 24 hours old. With SiteGround GoGeek, you can restore the entire site yourself, or just the database or files. However, there is one big catch with the SiteGround backups. Unless you’re on the GoGeek (or GrowBig) plan, you’ll have to pay to have a backup restored. Also, if you want to create your own backup outside the automatic backup schedule, such as before installing a new plugin, you’ll have to be on the top-level GoGeek plan to be able to create backups on demand (although you can purchase the ability to create a single backup on the StartUp and GrowBig plans as and when needed). When restoring the file backup, you can select which files to restore. Thankfully, unlike some other web hosts, SiteGround don’t have a list of prohibited WordPress plugins. This means you’re free to install your own choice of WordPress backup plugin and create and restore backups on your own terms. A key aspect of maintaining a safe and secure WordPress website is keeping the WordPress software up to date. Thankfully, as part of their managed WordPress hosting service, SiteGround will take care of this for you. The SiteGround WordPress auto update manager also gives you the option of enabling automatic plugin updates, taking another job off your hands. The WordPress Auto Update Manager gives you some control over when the WordPress software is automatically updated. To give you time to test new releases on your website, you can delay auto updates for up to 72 hours. You also have the option of skipping a pending update, but, to do so, you’ll have to log in to the manager and opt out of the forthcoming update. If you haven’t had time to test your website with a WordPress update, you can skip it until you’re ready. For extra convenience, your WordPress website will be automatically backed up before any updates are applied, giving you the ability to roll back to a previous state should something go wrong. Although, as mentioned, if you’re not on the GoGeek plan, you’ll have to pay to restore the website back up. 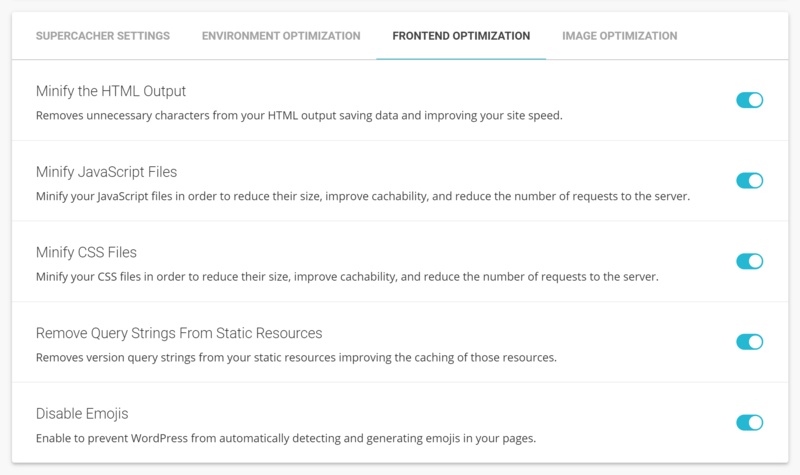 To help to improve the speed of your website, SiteGround have created a custom WordPress caching plugin — SG Optimizer — that lets you manage the caching of your websites from inside the WordPress Dashboard. The plugin is installed on new SiteGround-hosted WordPress websites by default, and includes an easy-to-use interface for controlling how your website is optimized. The SiteGround Optimizer plugin delivers lots of functionality through a user-friendly interface. The SiteGround caching tool gives you a lot of control over how this technology is applied to your website, comparing favorably with some of the best premium caching plugins for WordPress. Features such as image optimization, file minification, and lazy loading can be enabled through the SG Optimizer interface. When it comes to the type of caching that’ll be available to your website, customers on the mid and top-level GrowBig and GoGeek plans get access to the WordPress Special Cache feature, while those on the entry-level StartUp plan do not. There’s also the proprietary SuperCacher technology in place that aims to increase the number of hits a site can handle at the same time, while also boosting overall speed. 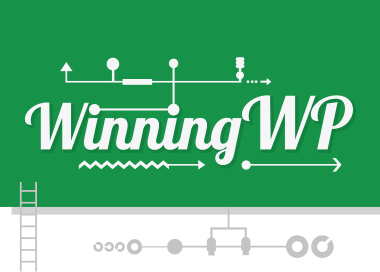 The hosting plan you choose will dictate which type of website caching you get access to. Level 1: Static content cache (all plans). Level 2: Dynamic data cache, both powered by NGINX (GrowBig and GoGeek plans). Level 3: Database queries results cache, running on Memcached (GrowBig and GoGeek plans). The site speed test results section of this comparison should give you a better idea of the impact of the different levels of caching. A staging version of your website lets you safely test the latest version of WordPress, edit code, and make other changes — without putting the live site at risk or disrupting the user experience of your visitors. Only the top-level GoGeek plan includes this functionality. Creating and managing a staging environment takes place through the account area on the SiteGround website, and, during the testing for this review, everything worked as expected. 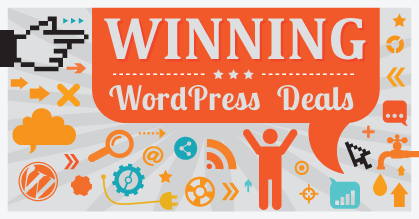 Only the top-level GoGeek plan includes access to the WordPress website staging tool. 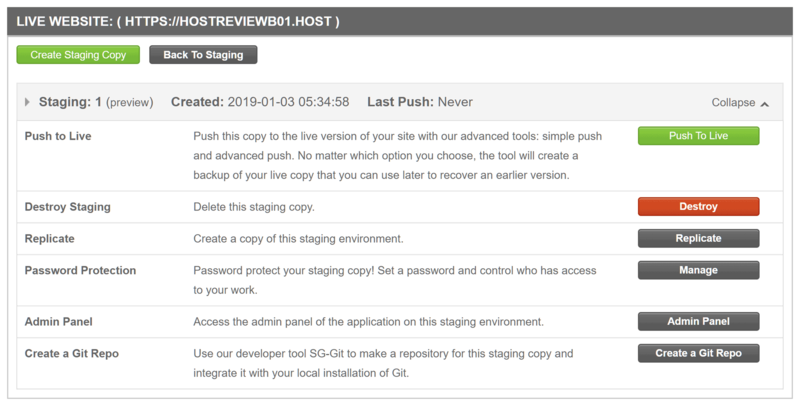 When you’re ready, you can automatically push the entire staging site to your live hosting environment, or, instead, choose which elements of your test site to transfer. If you don’t want to transfer the entire test site, the SiteGround staging tool will helpfully display the tables of the staging site database that you’ve changed. The SiteGround staging tool lets you choose which changes to push to your live site. You can then choose which of those tables to push to the live site. Thanks to this functionality, you have the option of, for example, only transferring the table that contains the site settings, without overwriting any other parts of your live site, such as the posts or user comments. For extra safety, a full backup of your live site is automatically created before you push the changes from the staging environment. 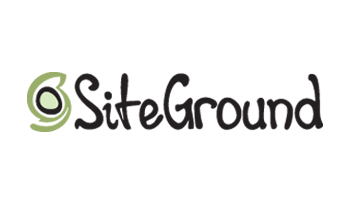 Creation and management of the staging environments takes place in the SiteGround account area. If you’d like a safe space where you can try out new plugins or experiment with different theme settings and code snippets, the staging tool is another good reason to choose the GoGeek plan over the StartUp and GrowBig plans. All of the SiteGround managed WordPress hosting plans include an email service that allows you to create unlimited addresses and inboxes for your domains, such as hello@yourdomain.com or contact@yourdomain.com. You can send and receive emails through three of the most popular web-based mail clients, including RoundCube and SquirrelMail, enabling you to access your email accounts from any computer with an internet connection. Alternatively, you can configure a service such as Gmail or Outlook to send and receive messages using your website domain email address. All SiteGround plans include the ability to create unlimited email addresses and inboxes for your domain. Although all plans include access to the SiteGround email service, the GoGeek plan has a larger mailbox capacity and a few other increased allowances compared with the StartUp plan. 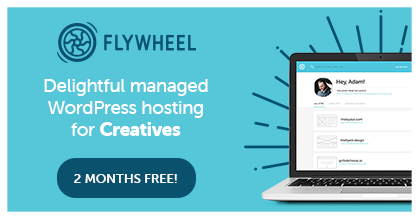 Even some of the best premium managed WordPress hosts that cost over twice the price of the StartUp and GoGeek plans don’t include an email service, so it’s great to see this available for all SiteGround customers. Website caching: in-house SuperCache service with limited caching available on the StartUp plan and all levels of caching available on the GoGeek plan. Management of site caching and optimization provided via in-house WordPress plugin. Content Delivery Network (CDN): All SiteGround WordPress hosting plans include optional integration with a free CDN plan from Cloudflare, with the ability to upgrade to a paid plan or choose your own CDN provider. 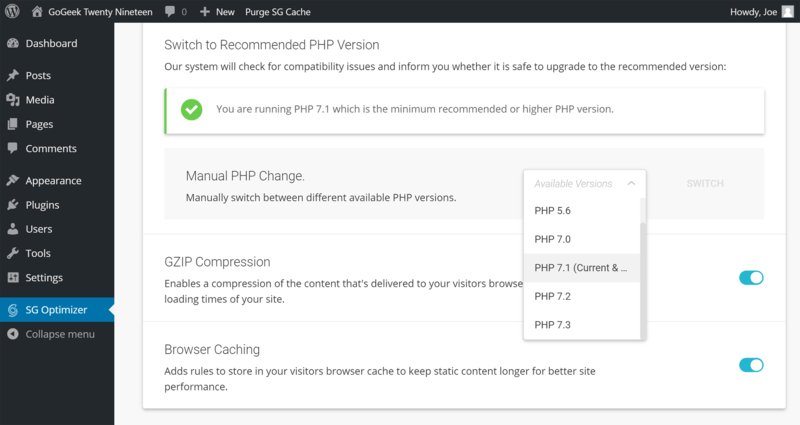 PHP: Ability to switch between PHP versions 5.5, 5.6, 7.0, 7.1, 7.2 and 7.3 from inside the WordPress Dashboard or via cPanel. HTTP/2.0: In use on the servers and the CDN. SSL: Use the free Let’s Encrypt SSL certificate, import your own certificate, or purchase a different certificate through SiteGround. SFTP: Ability to create multiple Secure FTP accounts to access your web space for uploading and editing files. Server file manager: Online browser-based file manager accessed via cPanel. Database access: phpMyAdmin is used to access the WordPress website database through a browser. Email service: Email service on all SiteGround shared hosting plans with largest mailbox size on GoGeek plan. WordPress website management: Auto-updater tool that keeps the WordPress software and plugins (optional) up to date with the ability to delay and skip individual updates. Plugin restrictions: No list of disallowed plugins, unlike some managed WordPress hosts. Security measures: Websites are scanned for malware and other security issues by SiteGround. Additional protection available through the paid SG Site Scanner add-on. Post-hack clean-up services: SiteGround will not help clean up your site if it gets hacked, but will refer you to Sucuri. Data center locations: Choice of four server locations in the UK, EU, Asia and the USA. Staging sites: The top-level GoGeek plan includes a useful staging tool, but the StartUp plan doesn’t. WordPress website migration: The GoGeek plan includes one WordPress website transfer per account handled by the SiteGround support team. StartUp customers can use the free SiteGround Migrator plugin to move their websites. Uptime checks and guarantee: SiteGround monitor their servers for downtime but don’t check the status of the sites they host. SiteGround guarantee a network uptime of 99.9% on an annual basis (which allows for around 8h 45m of downtime per year), with hosting credits offered if uptime falls below 99.9%. Support channels: The support desk is staffed 24/7, with live chat, telephone and ticket channels available on all plans. Support issues raised by GoGeek customers are given priority over StartUp (and GrowBig) customers for faster turnaround times, although StartUp customers can upgrade to Premium Support for an extra monthly fee. You can view all of the differences between the StartUp and GoGeek hosting plans on the plan comparison page of the SiteGround website. As the StartUp and GoGeek plans are managed WordPress hosting services, it should come as no surprise to learn that creating a WordPress website on your account is very straightforward. In fact, thanks to the new account wizard, you can opt to have WordPress automatically installed during the signup process. Not only that, but new WordPress installations at SiteGround now include the in-house WordPress Starter plugin that aims to simplify the process of setting up a new site. Once you log in to your new WordPress website, the Starter tool will help you to choose a theme for your site. 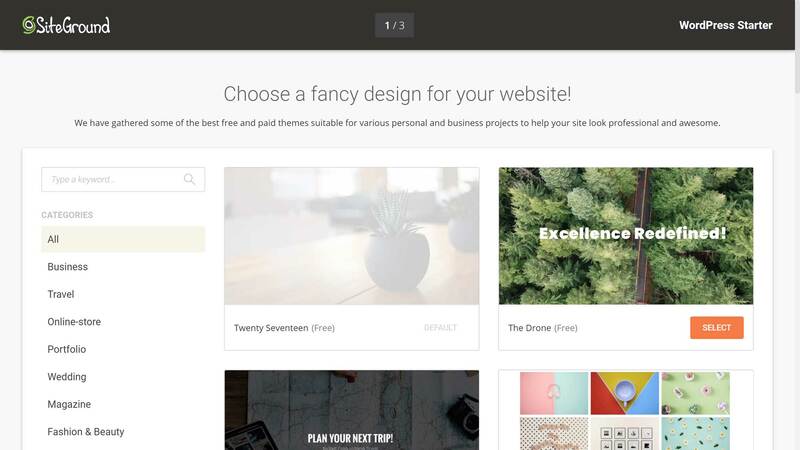 The SiteGround WordPress Starter lets you choose from a selection of free and paid themes from a range of sources. Once you’ve chosen a theme, or elected to stick with the current default Twenty Nineteen theme, you have the option of enabling some essential features, such as a contact form, calendar tool and the Jetpack suite of tools. You can also add some useful features to your WordPress website through the Starter. The third and final step of the WordPress Starter gives you the opportunity to enable some marketing-related extensions, including the Yoast SEO and Monster Insights Google Analytics plugins. After this, WordPress will be installed according to your specifications and ready for you to log in to. The SiteGround enhanced WordPress experience doesn’t end there, though. 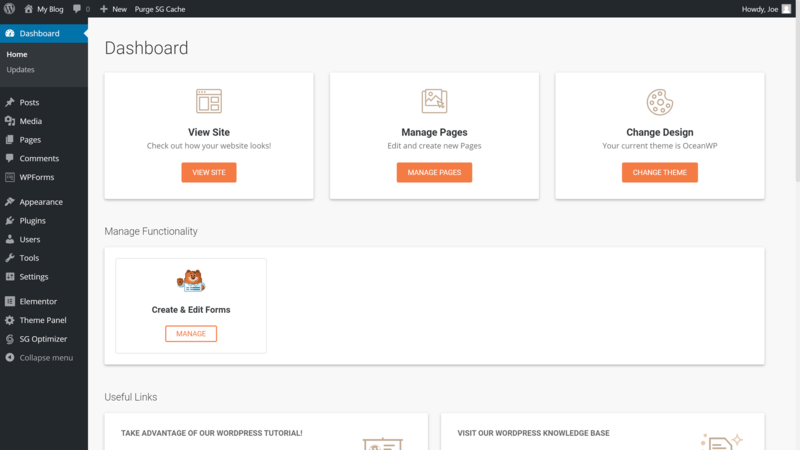 When you log in to your new website, you’ll see that a custom dashboard has been created to make it easier to find the most-used features of WordPress, such as the content creation sections and design settings. 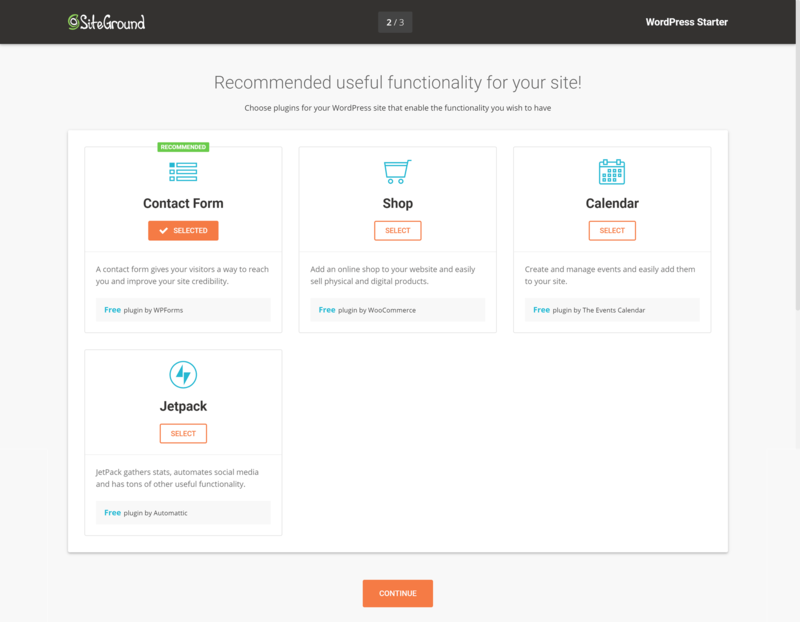 SiteGround-hosted WordPress websites have an optional custom dashboard. There are also links to useful support content on the SiteGround site should you need any assistance. If you’re not a fan of the custom SiteGround WordPress Dashboard, you can easily switch to the default version at the touch of a button. Thanks to the Starter tool, you can take care of the essentials, such as choosing a theme, adding a contact form or enabling an SEO plugin, all in one go, without having to leave your WordPress Dashboard. Of course, you can change the themes and plugins later on. However, when it comes to getting up and running, the Starter makes it easy to launch a new WordPress website in just a few steps. Although most web hosts now take care of installing WordPress for you, not all of them are as helpful as the SiteGround Starter tool when it comes to setting up your new website. If you’ve chosen the GoGeek plan, with the ability to create unlimited WordPress websites (storage allowance permitting), then you can create a new WordPress installation in just a few clicks through the cPanel account management interface. To do so, simply log in to your SiteGround account area, click on the cPanel button and then the WordPress link in the Auto Installers section. SiteGround make it easy to create additional WordPress installations on your account. You can then choose which domain or subdomain to install WordPress on, and also provide the login details for the new site. You can also select whether to enable the classic WordPress Editor or use the new default version of the Editor, and decide whether to include the SiteGround WordPress Starter tool that’s active on new sites by default. Once you’ve taken care of the essentials, you can start optimizing your site through the SiteGround Optimizer plugin control panel from inside your WordPress Dashboard. 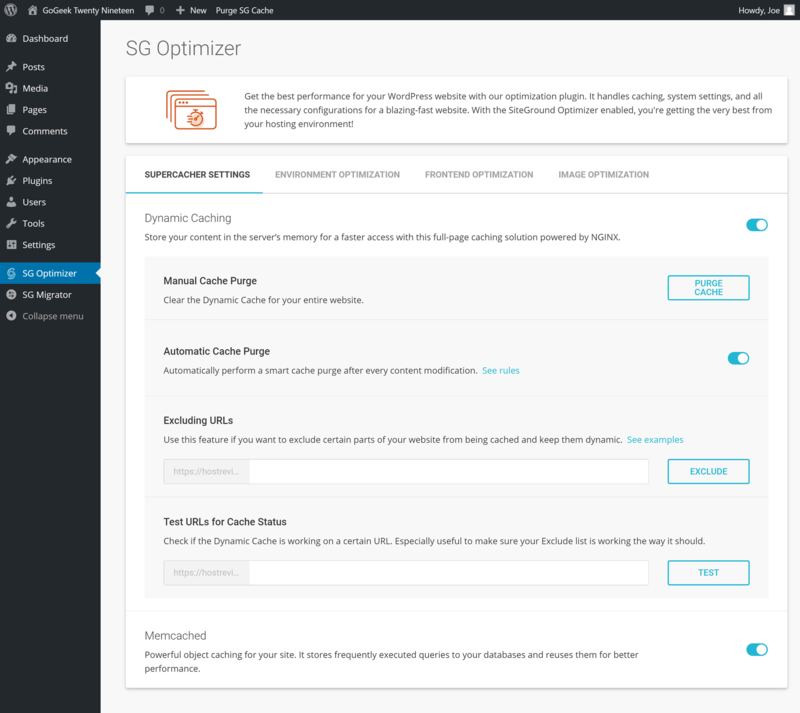 We’ve already covered the main functionality of the SG Optimizer plugin and the different ways it can optimize your site in the WordPress Website Caching section of this comparison. 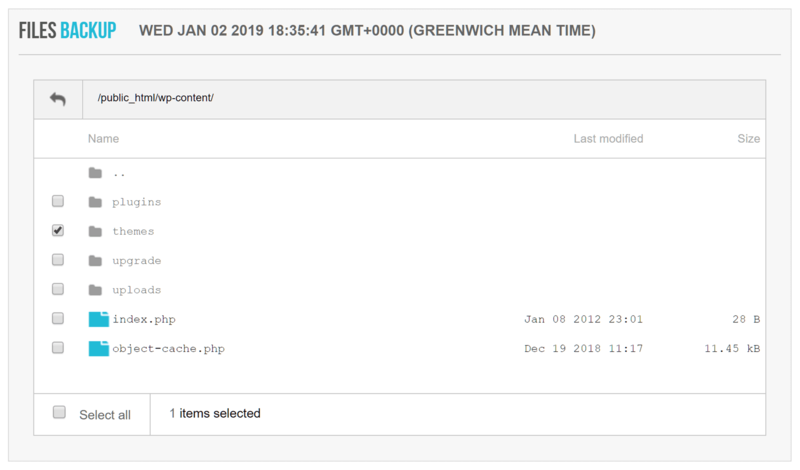 However, one useful extra feature of this tool that’s worth highlighting is the ability to switch between the available PHP versions directly from inside your WordPress Dashboard. The SiteGround StartUp and GoGeek plans have lots of flexibility when it comes to choosing a PHP version. As mentioned, SiteGround users can choose from an impressive range of PHP versions, ensuring maximum compatibility with plugins old and new. In addition to this, you can purge the cache at any point by clicking on the handy link on the WordPress admin toolbar or inside the SG Optimizer dashboard. 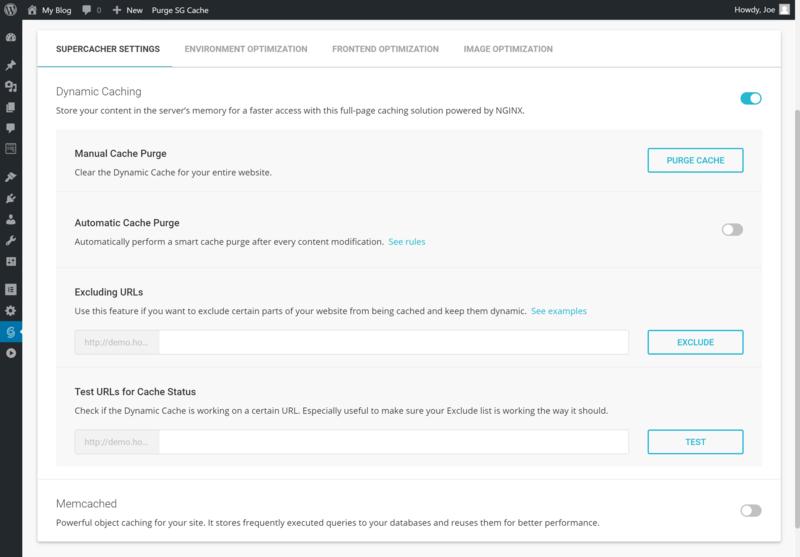 So, although the plugin will refresh the cache automatically each time site content is modified, you can manually flush the cache as needed, such as when testing new plugins or theme settings. Defining URLs to exclude from being cached is just one feature of the SiteGround caching tool. Thanks to the integration with cPanel, you can also flush the cache without going through the WordPress Dashboard. Therefore, if you’re managing a site for a client, or don’t want to log in to the WordPress Dashboard for another reason, you can still clear the cache for a particular website on your account. 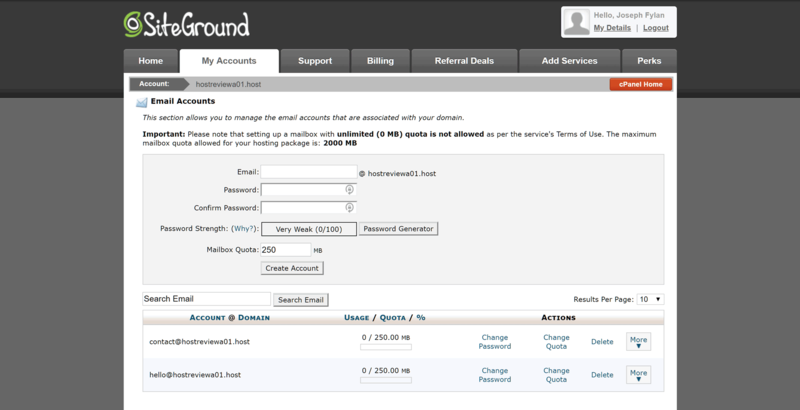 You can also control the different levels of caching used on your website through the SiteGround account area. As well as caching, another way to help improve the speed of your website on all plans — including StartUp and GoGeek — is access to a content delivery network via a free plan from Cloudflare. This optional integration with Cloudflare can be activated through the cPanel for your website. Once activated, the CDN is managed through the SiteGround account portal, giving you control over which aspects of your website are optimized in this way. 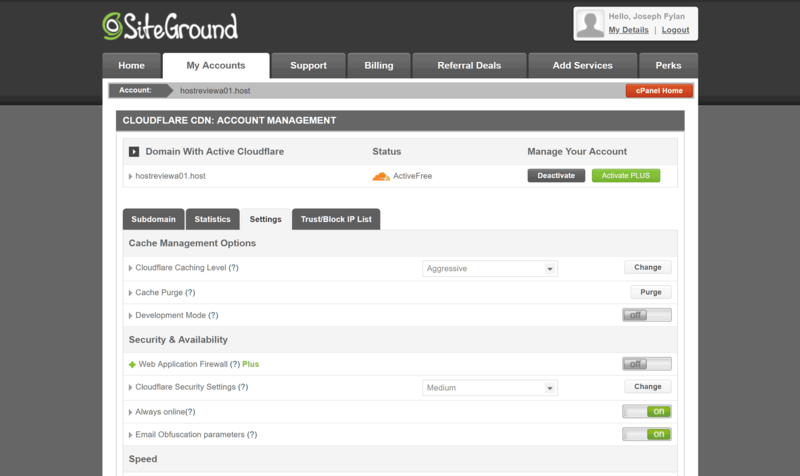 All SiteGround hosting plans include optional integration with the free Cloudflare CDN service. As well as opting to upgrade to the paid Cloudflare CDN service, you can also use your own choice of CDN instead. If you have people from around the world visiting your site, using a CDN is a great way to ensure all visitors experience similar loading times, no matter where they’re based. Thanks to the free Cloudflare CDN integration, SiteGround make it very easy to enable this performance-enhancing feature. However, in our testing, enabling the CDN did cause the sites to go offline for a few minutes while the redirects took effect, so proceed with caution. As you can see, there are a few steps involved in setting up and optimizing your WordPress website. However, SiteGround have done a good job of making the process as easy as possible, while still providing access to some advanced features and services, such as a CDN and multiple levels of caching and optimization. When it comes to managing the files that make up your website and its underlying database, SiteGround provides you with full access. In addition to using your choice of FTP client to log in to your server space, you can also use the online file manager that’s available through the cPanel dashboard. As well as accessing the server via FTP software, you can also use the cPanel file manager. Accessing the database is just as straightforward — again, thanks to software (this time phpMyAdmin) that’s accessible through the cPanel dashboard. The database for your WordPress website can be easily accessed through the phpMyAdmin web-based interface. If you ever need to delete or edit a theme or plugin file, change your WordPress admin password after being locked out of your site, or carry out some other type of similar task, then having this level of server and database access is invaluable. That pretty much covers the experience of using the SiteGround hosting service to set up and manage a WordPress website. As you can see, the SiteGround StartUp and GoGeek managed WordPress plans are ideal for both those who are new to WordPress and power users alike. As we’ve just covered, the SiteGround StartUp and GoGeek plans have lots of features that aim to increase the performance of your WordPress website, as well a few differences in the performance enhancement levels of each plan. So, to help you to decide whether the top-level SiteGround GoGeek hosting plan is best for your website or whether the lower-priced StartUp plan will suffice, we created some WordPress websites and then tested their performance. First up, the speed of our test sites were recorded to see how quickly they loaded on average over a seven-day period. Then, we used a load simulator to find out how well websites on the StartUp and GoGeek plans performed when multiple visitors were accessing them at the same time. We also monitored the uptime of the test sites to see how our experience compared with the SiteGround 99.9% network uptime guarantee. To get a fuller picture of what sort of loading times you might experience if you choose the StartUp or GoGeek hosting plans from SiteGround, we recorded the speed of a WordPress website using a lightweight WordPress theme, as well as a second site using a more demanding feature-rich multipurpose alternative. The paid Pingdom service was used to monitor the speed of the websites, with the loading times recorded at 30-minute intervals over a seven-day period. First up is a comparison of the StartUp and GoGeek plans using a simple free WordPress theme. The current default theme that’s activated on new WordPress websites is the free Twenty Nineteen theme from the WordPress.org team. It’s a good example of a basic lightweight theme that many new WordPress website owners might use. Twenty Nineteen is the latest default WordPress theme and was used for our speed tests. The test site hosted on the GoGeek plan loaded in an average of 588 milliseconds, while the StartUp hosted site was slightly quicker with an average of 576 milliseconds. Surprisingly, the site hosted on the more expensive — and apparently more powerful — GoGeek plan was slightly slower than the site hosted on the lower-priced StartUp plan. However, with the site on the StartUp plan loading only 12 milliseconds — or around 2 percent — faster than the GoGeek hosted site, there isn’t much to separate these two plans when it comes to hosting WordPress websites with a lightweight theme installed. 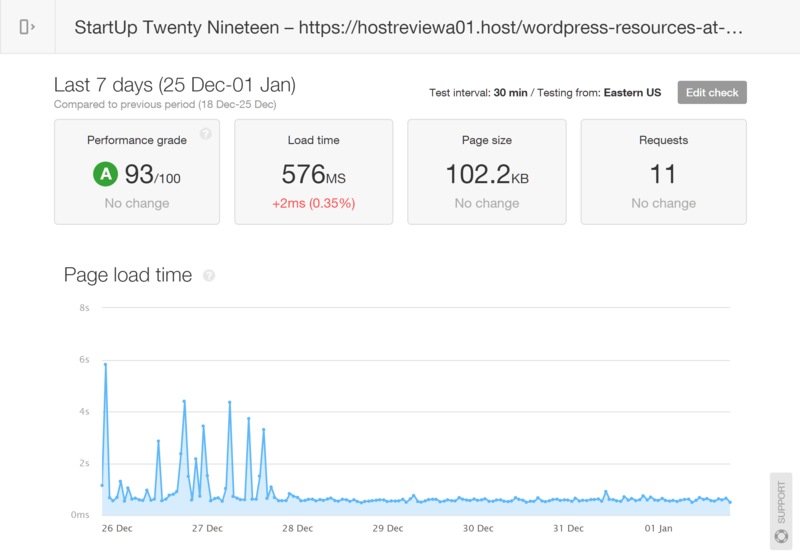 The loading times of the WordPress website hosted on the StartUp plan using the Twenty Nineteen theme. 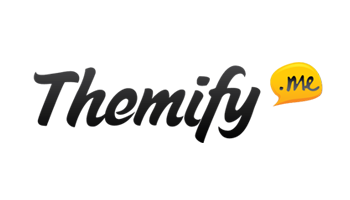 Over the seven-day period, Pingdom recorded an average loading time of 576 ms for the site hosted on the StartUp plan using the lightweight Twenty Nineteen theme. 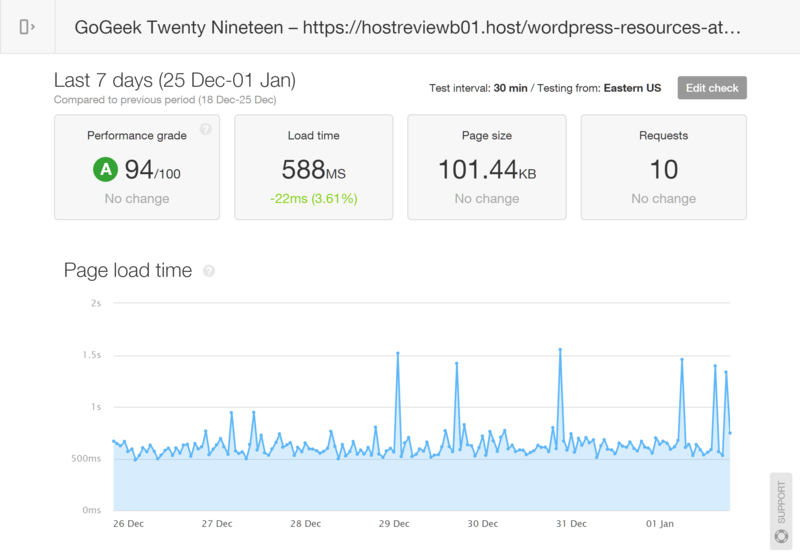 The loading times of the WordPress website hosted on the GoGeek plan using the Twenty Nineteen theme. Compared with the site hosted on the StartUp plan, the GoGeek-hosted site was slightly slower when using a lightweight theme, with an average load time of 588 milliseconds. Although free lightweight themes such as Twenty Nineteen are ideal for basic blogs, there’s a good chance you’ll opt for a more feature-rich multipurpose WordPress theme for your website. Because of their enhanced functionality and versatility, these themes tend to have larger file sizes that can cause websites to load more slowly compared with a lightweight theme. So, to give you an idea of the loading times you might expect if you choose a feature-rich multipurpose theme, we’ll also compare the loading times of two test sites on the StartUp and GoGeek plans with the best-selling Avada theme activated. To test the StartUp and GoGeek loading times with the Avada theme, the Agency demo was used on both sites. When it came to using a feature-rich WordPress theme with a larger file size, the GoGeek-hosted site was much faster than the site on the StartUp plan. Because we were using a more heavyweight theme, as the overall loading times of the test sites increased, the difference in performance between the StartUp and GoGeek plans became clear. Over a seven-day period, the Avada Agency homepage loaded in an average time of 2.07 seconds with the StartUp plan. As expected, with a page size of 1.03 MB — compared with 102.2 KB for the Twenty Nineteen theme — the Avada theme homepage took longer to load, with Pingdom recording a seven-day average of 2.07 seconds for the site on the StartUp plan. The homepage of the site using the Avada Agency demo hosted on the GoGeek plan loaded in an average of 1.59 seconds. The homepage of the site hosted on the GoGeek plan loaded in 1.59 seconds on average, compared with 2.07 seconds for the site hosted on the StartUp plan. This appears to show that the more feature-rich or greater the size of your site, the more it will benefit from being hosted on the higher-tier plan. 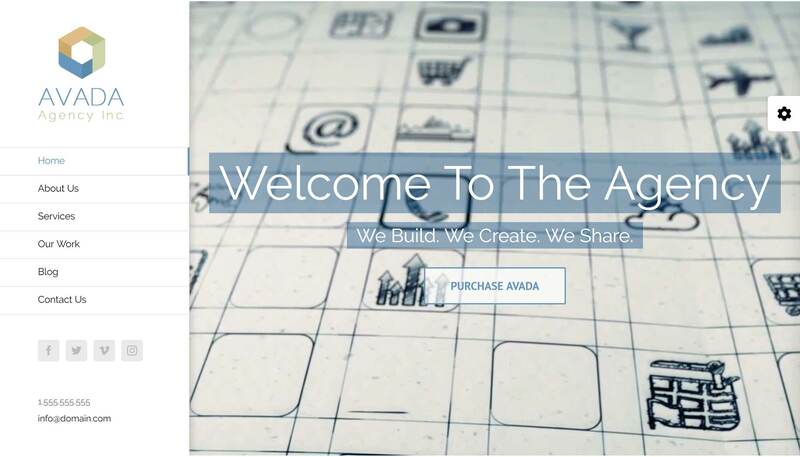 Although the Avada Agency demo homepage looks impressive, your website homepage may not include the slider, image gallery, animations and other file-size-increasing features of this prebuilt layout. So, to provide you with extra information about the capabilities of the GoGeek and StartUp plans, we also tested a less feature-rich page on the same sites, still using the Avada theme. We also tested a less resource-intensive blog post built using the Avada theme. The blog post tested with Pingdom had a smaller file size of around 540 KB, compared with the 1.03 MB of the Avada Agency homepage layout, and therefore loaded much more quickly. As you may have anticipated from the test results of the Avada demo homepage, the results showed the GoGeek plan was also better at delivering the blog post (see below). 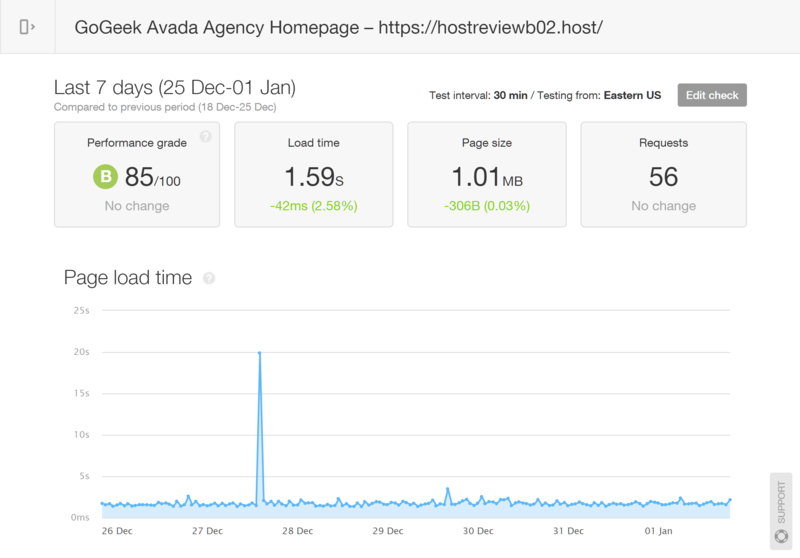 The loading times of the blog post using the Avada theme showed again that the GoGeek plan was better at handling a feature-rich theme than the StartUp plan. 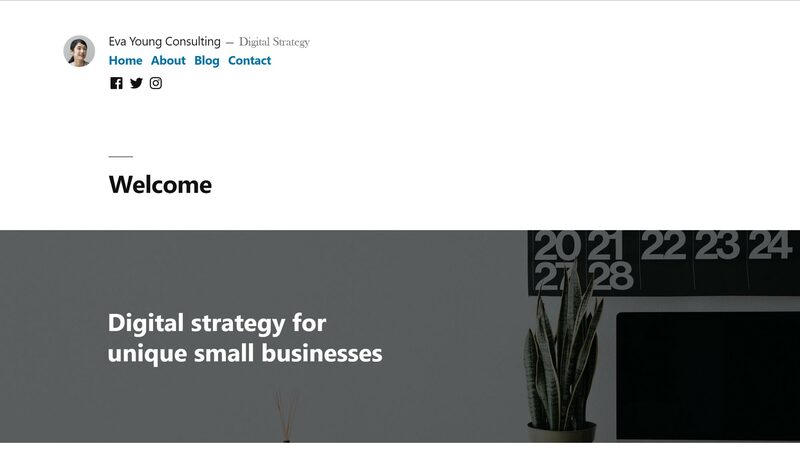 The blog post from the website hosted on the StartUp plan using the Avada theme loaded in an average of 1.7 seconds. In the blog post test, the GoGeek-hosted site loaded in 1.3 seconds compared with 1.7 for the StartUp-hosted site. With an average loading time of 1.3 seconds, compared with 1.7 seconds for the StartUp-hosted site, the blog post of the GoGeek-hosted site was faster when using the Avada theme, with a difference of 0.4 seconds. Each number represents the same site but on a different hosting plan. E.g. 1 is the Avada Agency blog post test with the results for the StartUp and GoGeek-hosted sites. These site speed test results suggest that if you plan to use a lightweight theme for your website without many extra widgets or features, then you may not experience much difference regardless of whether you choose the SiteGround StartUp or GoGeek plan. However, if you plan to create a more advanced website, or use a more feature-rich theme, then choosing GoGeek over StartUp should result in faster loading times. There are some slight variations in page size and number of requests in the Pingdom results. These differences can be attributed to the different levels of caching available on the StartUp and GoGeek plans. Also, the test sites were hosted in the SiteGround data center in Chicago, USA, and for Pingdom the Eastern US testing location was used to monitor the loading times. Furthermore, the free Cloudflare CDN integration from SiteGround was enabled for all tests sites. The page speed tests of the WordPress websites hosted on the SiteGround StartUp and GoGeek plans were carried out on test sites that didn’t receive any visitors. So, although they do give you a good idea of how the performance of these two plans compares, they don’t tell the full picture. Therefore, to give you a better idea of which plan is the right hosting choice for your website, we also carried out some load testing. 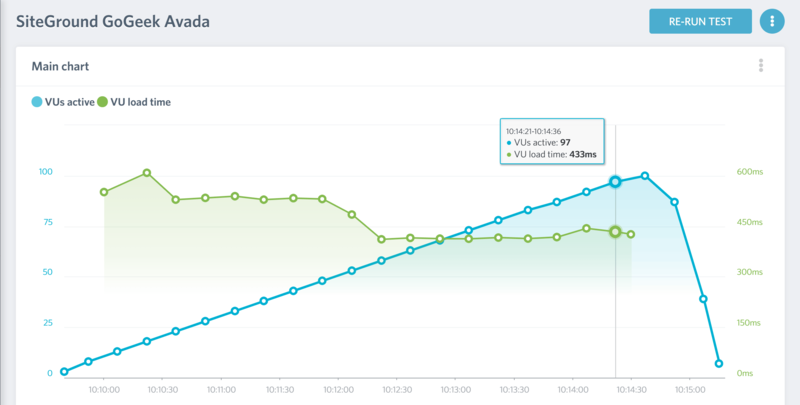 By running paid tests from the Load Impact service, we were able to simulate multiple users visiting each website at the same time to see how they handled an increasingly heavy user load. 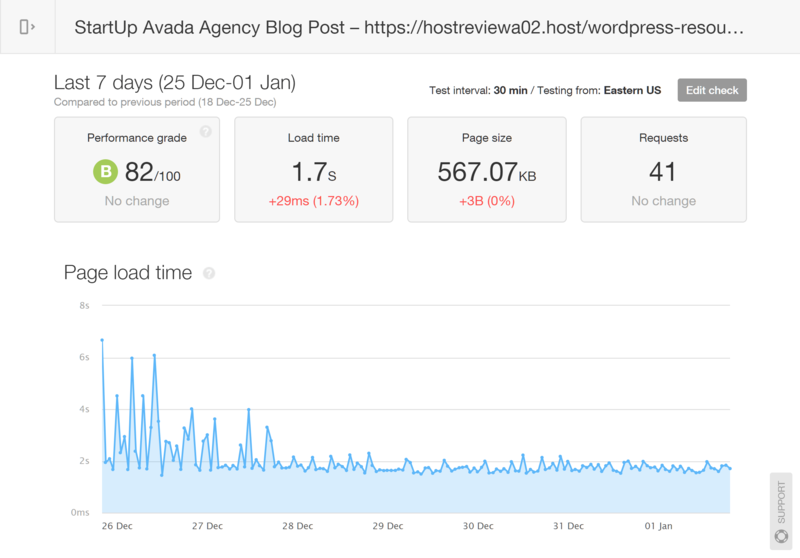 For the tests, the loading times of a blog post on the StartUp and GoGeek-hosted WordPress websites using the Avada theme were monitored by Load Impact. During the test, the number of virtual users accessing the page being monitored increased over a five-minute period, until there were a hundred virtual users accessing the page at the same time. 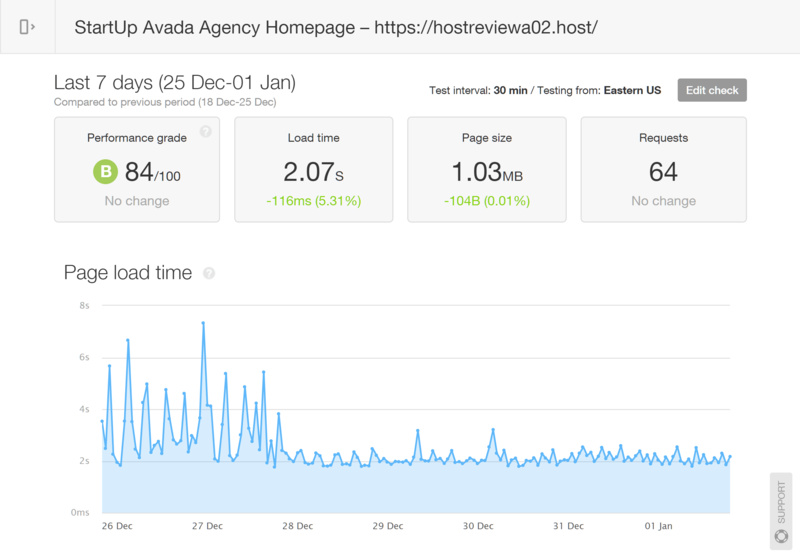 According to the Load Impact test results, the SiteGround entry-level StartUp plan did a pretty good job of hosting the WordPress website with the relatively heavyweight Avada theme installed. 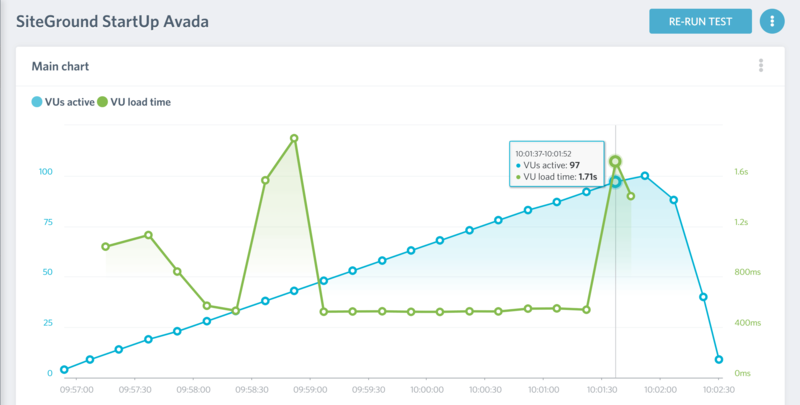 The green line shows that the loading time of the site hosted on the SiteGround StartUp reached 1.71 seconds with 97 virtual users. Although, as the green line on the graph above shows, the loading times were a little erratic as the number of simultaneous virtual users increased. However, the site never became unresponsive as the numbers went up. By the time there were 43 virtual users simultaneously accessing the site, the loading time had reached a slow 1.94 seconds. However, the performance of the site quickly stabilized and the loading times dropped back to around half a second until 97 visitors were online and the times jumped to 1.71 seconds. As the test results suggest, if you don’t expect more than 50 visitors to be accessing your site at the same time on a regular basis, then the StartUp plan should be able to handle your audience without much difficulty. For more information on how the StartUp-hosted site performed, you can view the test results yourself on the Load Impact website. Although the StartUp-hosted site seemed pretty robust when up to 100 virtual users were accessing it at the same time, the WordPress website on the GoGeek plan was even more stable. The green line shows the SiteGround GoGeek-hosted site loaded in 433 milliseconds when 97 virtual users were accessing it simultaneously. As the green line on the graph from Load Impact shows, the loading time of the test site wasn’t really affected at all during the entire test. In fact, by the end of the test, when there were 97 virtual users simultaneously accessing the site, the page speed was an impressive 433 milliseconds. Therefore, if you’d like your WordPress website to be able to handle large numbers of users or surges in traffic, the GoGeek plan would be a good investment. To see for yourself how the GoGeek-hosted website performed, you can view the test results on the Load Impact website. High levels of uptime are just as, if not more, important than fast loading times. After all, if your site’s not available, then it doesn’t matter how fast it loads when it’s online. 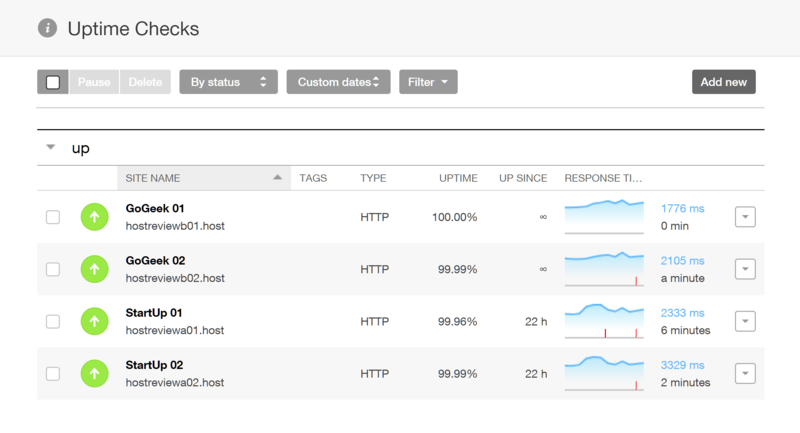 So, with that in mind, we also monitored our test sites for downtime using the Pingdom uptime checker. Three of the four sites being monitored experienced some downtime during the testing period. As the results from Pingdom show, three out of the four test sites did experience some downtime during the 11 days of testing. However, although this was disappointing to see, the amount of uptime never dropped below the level of 99.9% guaranteed by SiteGround. Overall, our test websites hosted by SiteGround were easy to set up and performed well under pressure, with the site on the GoGeek plan remaining very stable when experiencing a heavy load. Our tests on the StartUp and GoGeek plans make it clear that SiteGround are indeed a high-quality yet budget-friendly host. Those new to WordPress will appreciate the user-friendliness of the SiteGround experience, while power users should enjoy the freedom offered by cPanel and phpMyAdmin, as well as other features, such as the staging tool of the GoGeek plan. In fact, when it comes to features and functionality, the SiteGround plans compare favorably to many of the much more expensive premium managed WordPress hosting companies. However, as our comparison of SiteGround and WP Engine shows, the lower-priced plans from SiteGround aren’t as fast as those from WP Engine. 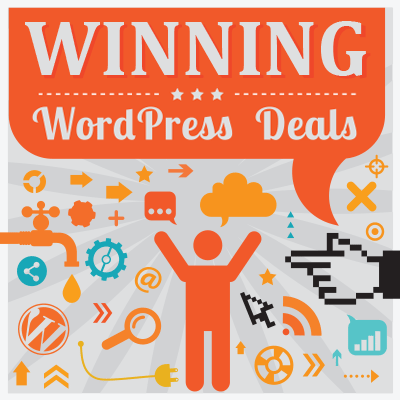 (Note: For those who don’t know, WP Engine are regarded as one of the higher-end — albeit also more expensive — managed WordPress hosting services.) But, unless you’re willing to pay $30 per month or more, SiteGround are a worthy alternative — especially when compared with other low-cost hosts such as GoDaddy or Bluehost. Overall, choosing SiteGround for your website is highly recommended — especially if you can’t justify the price of an entry-level plan from the likes of Kinsta (read our full review here) or WP Engine. When it comes to whether you should go with the StartUp or GoGeek plan, the faster but more expensive GoGeek is the obvious choice in terms of increased website performance and extra features. However, if your budget can’t accommodate the higher price, the more affordable StartUp plan is a good compromise. Used/using SiteGround hosting? Opinions? Thoughts?